The summer events season is a great way to combine fun and entertainment with charity. Whether you’re thinking of holding a mini music or literature festival, dinner and dance, or pop up fashion event, there are plenty of ways you can raise a bit of extra cash for a charity in need. Think about your talents, interests and resources. This should help you decide what type of event you could realistically put on. Make sure good entertainment is central to the event to ensure that it’s popular to the public. Once you’ve decided on a type of event, think about how you might be able to raise money for the charity you have in mind. For a dinner and dance something like a raffle would work well; remember to get as many exciting prizes as possible for entrants though to encourage people to join in! For a festival or pop up fashion event you may wish to give profits from ticket prices to a charity. Alternatively, you might like to use your event to improve the profile of a charity, encouraging others to donate freely. Start planning the finer details such as the date, location and amenities. Think about what days or months might work best for your intended audience. Will school holidays or term times be better? Evenings or weekends? You will also have to recruit a trusty team to help you plan your event and look after things like marketing, selling tickets, obtaining sponsors, and sourcing prizes. Making sure your event looks good is key to getting attendees engaged with your event. If they turn up and think the space looks a bit naff it will be pretty hard to change their opinion, no matter what else you’ve got planned for the night. Get in touch with local wedding and event suppliers to see if they’re willing to pitch in while promoting their services. Many will be willing to help out if they can flyer at your event, get coverage from local press and can publicise their presence on their own website. Likewise, event caterers will also be keen if they get to hold on to their own profits. Last, but certainly not least, choose a staging solution from Unistage. You’ll want to build a stage that reflects the needs and feel of your event while maximising space at your chosen venue. 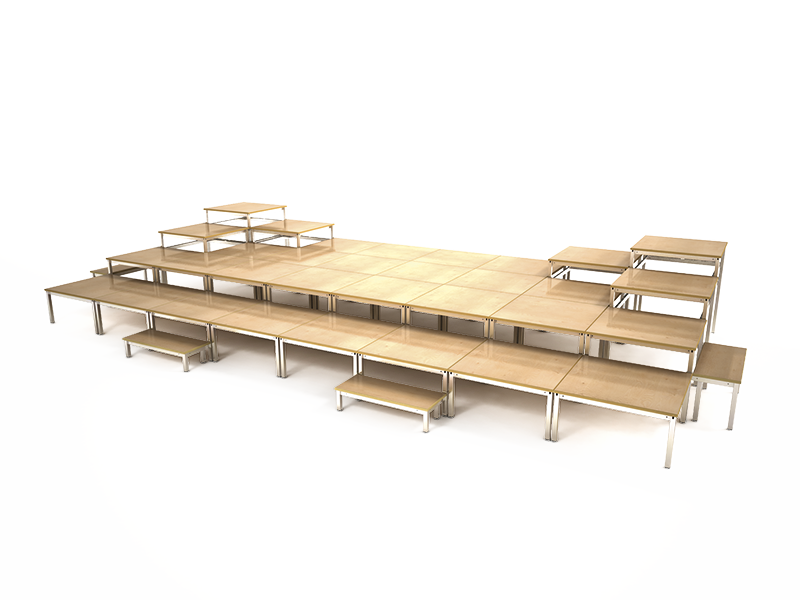 Our staging also offers the added benefits of being lightweight and flexible – meaning it can be moved quickly and easily and adapted for any form of entertainment. So if you’ve got a solo performer and a six-piece band due to perform, you’ll still only need one staging solution from Unistage. To find out more about our staging solutions contact us today. We’ll be able to suggest which of our products best suit your needs and will be able to provide recommendations on the set up for your next charity event. We’d love to hear what you’re getting up to!